Fleur de Bière®, flagship product and emblem of the Wolfberger Distillery, is a unique representative of the savoir-faire and innovative spirit found at the Alsatian cooperative. Fleur de Bière®, flagship product and emblem of the Wolfberger Distillery, is a unique representative of the savoir-faire and innovative spirit found at the Alsatian cooperative. After two years of research and trials, it was unveiled for the first time at the 1989 Eurobière fair in Strasbourg. Since that day, this atypical distillate of bière de garde with notes of tropical fruit, spices and citrus has enjoyed a lively success in Alsace as well as in northern France. 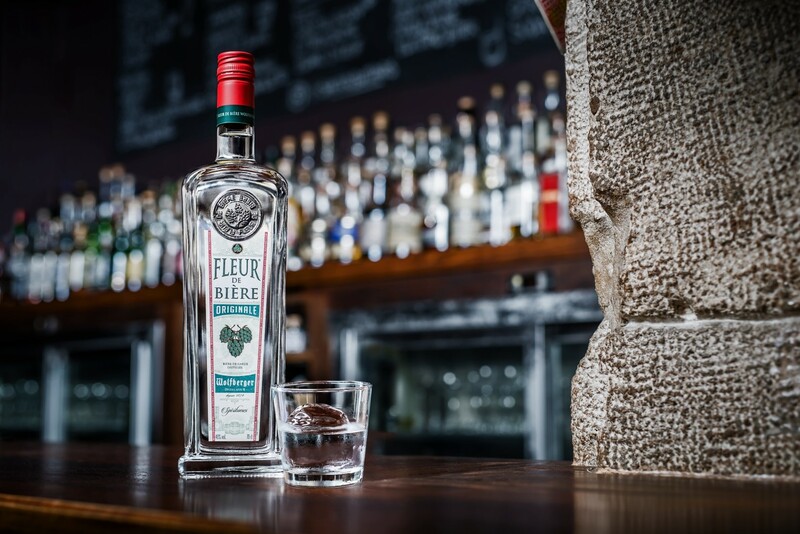 Now, with the spirits of yesterday making a huge comeback, Fleur de Bière® is centre stage with a new look, ready to claim its rightful place and become one of the indispensables of French bars and bistros. For Wolfberger, the eaux-de-vie and spirits are a little like perfume: refined and sensual at the same time. Having inherited unparalleled artisanal savoirfaire, our results embody the essence of the fruit or the plant. When tasting, they overwhelm the senses, both ar omatically and gus tatorily. The first ingredient is well and truly a mash tub of unpasteurized, unfiltered beer. This bière de garde called Wendelinus® is then distilled in a traditional copper still using the double pass method, which reveals this unique spirit’s true soul. During the first distillation, the bière de garde is heated for three to five hours. 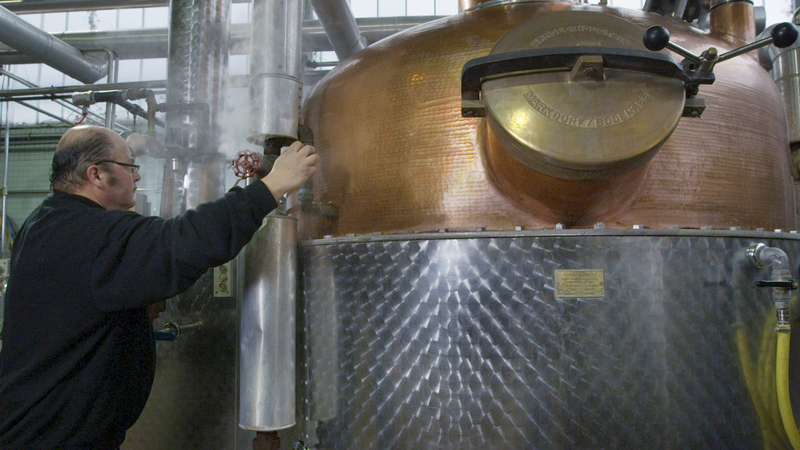 The resulting liquid, called brouillis, flows regularly from the first still to the second. Next comes the second pass, which also lasts three hours. During the distillation of the eaux-de vie, the “tails” are added to the brouillis while the “heads”, sharper and not as delicate, are eliminated. Only the “hearts” of the eaux-de-vie which run at around 65° volume of alcohol are directed to a stainless steel vat that allows the circulation of air, where they will age for a minimum of 15 months. Aging draws its inspiration from methods used by Alsatian ancestors who would put their eaux-de-vie in earthenware jars and stock them in the attic. This way the contents of the jars would be influenced by changes in weather and temperature variations. The naturally occurring phenomenon of oxidation improves the aging and allows the beer eau-de-vie to slowly ripen. Once the aging process is finished, the master liqueurist transforms the eau-de vie into a spirit using a recipe unchanged since 1989. After adding an infusion of spices, citrus and sugars according to a precise technique, the Fleur de Bière® is refrigerated and filtered, averaging 40° and able to be consumed as is. In a variation of the traditional Christmas Berawaecka, infusing the fruit in Fleur de Bière® to rediscover the original spicy recipe of this Alsatian fruitcake, a seasonal staple. French spirits are highly thought of by bartenders and mixologists. These bar stars are being seduced by regional alcohols that give a modern twist to innovative, astonishing cocktails. 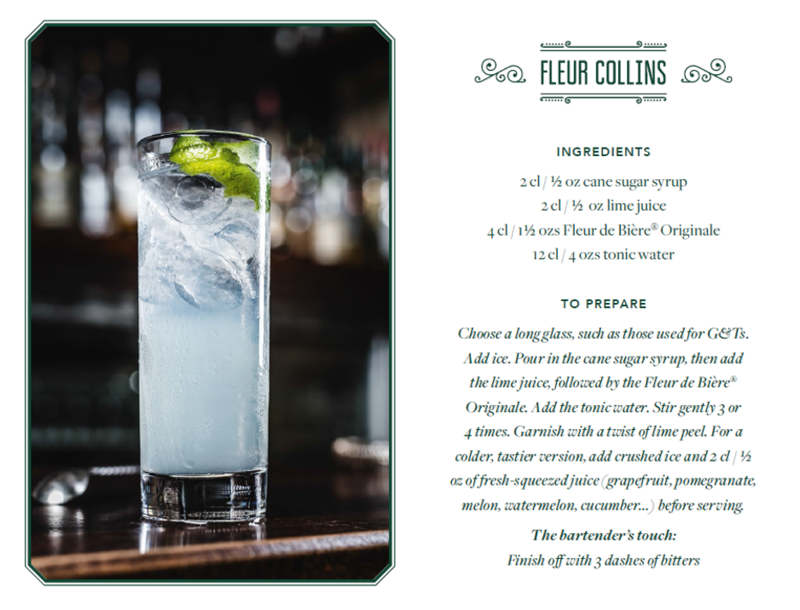 Spirits like Fleur de Bière® supply taste and body to the cocktails, from the simplest to the most elaborate. Fleur de Bière® has bright prospects and will continue to appeal to the senses. Stephen Martin, a seminal ambassador of the Wolfberger Distillery, has reworked the traditional recipe for a Gin and Tonic by replacing the gin with Fleur de Bière®, clearly a good idea. Ambitious and sophisticated, adding the Fleur de Bière® gives this timeless cocktail a touch of spice, a touch of gourmandise – made in Alsace.